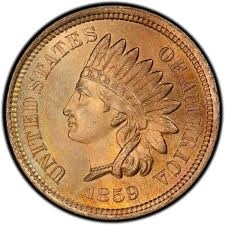 The 1865 Indian Head Cent had a mintage of 35,429,286. These coins are available in grades from Almost Good to Extra Fine. We use strict Photograde standards when grading all of our coins. Please allow 3 to 5 business days for your order to leave our offices as each coin must be inspected and graded prior to packaging.